Nobody likes wasting their time and college coaches are no exception. 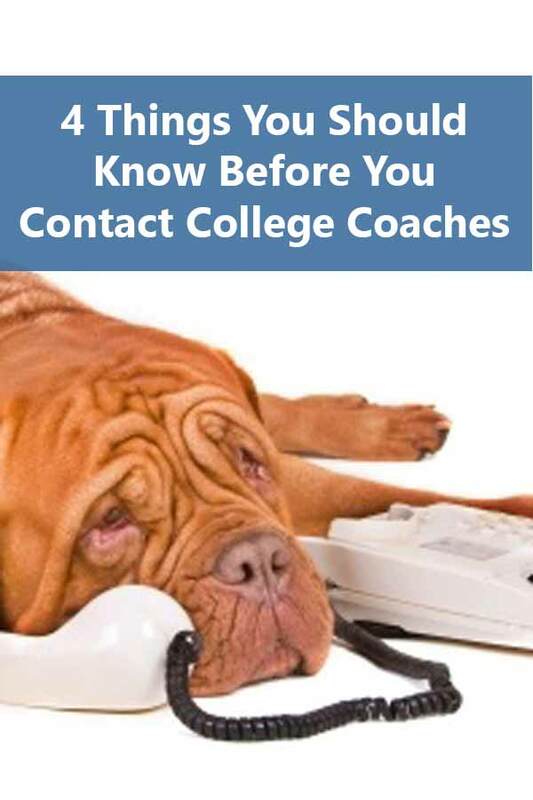 So when you start to contact college coaches, be sure that you are prepared. If nothing else, what sort of impression do you think you make when the coach has to inform you of basic facts regarding the school or finds out that you aren’t qualified to play on his team? For many student-athletes, the fear of the preceding happening is a major reason they don’t contact college coaches. Bad idea. Such an approach doesn’t make it any easier for the coach to recruit you either. The key is to be prepared. It’s easier to find out what level you’re at for some sports than others. Any timed or otherwise measured sport makes it easy to compare personal stats to team stats. Other sports, especially team sports, are more difficult. However, even team sports will have general recruiting guidelines for various positions at the different college levels. This combined with honest evaluations from high school and club coaches or feedback from prospect camps should help you target the right level for college. This means that you know that your current GPA for core courses puts you comfortably within the NCAA, conference, and school requirements for the team. Ideally, you’ll have taken either the ACT or SAT but if you haven’t, you’ll at least have taken a practice test that will predict your score. You aren’t recruitable if you don’t meet the academic requirements. You should have looked at the team’s roster as part of figuring out if you’re competitive or not. But knowing the team’s record and their conference competitors can save you from embarrassing comments. It may never come up in conversation, but if it does, you’re going to wish that you spent ten minutes looking at the conference records. Too many players don’t realize that this is a two-way process. Players need to be finding out if the coach, team, and school are a good fit them. There are all kinds of opinions about whether or not you should go to a school just because of a coach. But a coach could definitely be a reason not to attend a school if you don’t agree with his coaching philosophy or approach to winning. There are plenty of lists of suggested questions for specific sports available on the internet. Use them to create your own list. All of this assumes that you have an athletic profile as well as video available. If you don’t, take care of it before you make the phone call. You don’t want to have to be scrambling to pull it together if the coach expresses interest. Before you even start contacting coaches, there are three essential questions parents and players must answer “YES” to before spending one dollar on recruiting services or recruiting showcases. Learn more about the 3 questions here.